Anyone use or prefer Samsung mail to Gmail? If so, why? I started using Samsung email a few weeks ago...I was using Google Inbox but they're doing away with that and I tried Gmail but didn't like having ads mixed in with my emails so I decided to try the Samsung route. So far I'm liking it, it has a dark mode and doesn't have ads... It just works. Beansr519, smooches680 and libra89 like this. I like the gmail spam reporter. It automatically unsubscribes at the same time. Samsung email has better UI aesthetics. Conversation view and landscape mode works great. I use Samsung email and have for the past several years for both my Hotmail and Gmail accounts. I prefer all Google apps. These manufacturers need to do away with duplicating applications or give you a choice to remove them. bmetelsky and mclarryjr like this. Why would they need to remove them if people like them. Also not everyone uses gmail or even likes it or the app. It doesn't take up a ton of space or resources. Just disable it. I use samsungs email, samsungs gallery, samsungs messenger. Those are some of the small reasons I get Samsung devices. Harlemknight, libra89, Beansr519 and 3 others like this. Personally I prefer to keep all of my email accounts separate. Beansr519, srgonu and mustang7757 like this. You have ads mixed in with your emails in the Gmail app? I used to use the Samsung Mail in the past but my only issue and the only reason why I went back to gmail is because of calendar invites. When you tapped on yes it would open the web browser to Google Calendar which was super annoying. Whereas Gmail you just tap yes and it inputs into the calendar in the background. Not sure if this is still the behavior of Samsung Mail as I haven't tried to use it lately. Well I am a G-Suite user. I use it for my businesses. That's why I stick with Google products. Used to use Samsung email exclusively. But the app became a battery hog. Now using Outlook app with multiple accounts. Group email management - it is fantastic at this, including bcc group emails for gdpr. Gmail is terrible at group emails. Scheduled sync, can control when email syncs and switch it off after working hours. These are some of the reasons I prefer Samsung mail. This app is one of the key reasons I got the note over the mate 20! Couldn't take the risk the mates email app didn't do the things Samsung's did. I got rid of my GMAIL app. It got wonky and every time I deleted an email it would reappear in the inbox within minutes. I even tried immediately deleting it in the trash, and it still came back! I found this to be crazy and super annoying. Yep, that's supposedly a "feature"...I never found a way to opt out either. kct1975 and Beansr519 like this. Hmmm...I wonder why I don't have ads? Interesting. This is going to bug me now. Lol. Not that I want ads....lol. Odd...I have never had ads in my Gmail either. I don't think it's a feature. I have always had ads under my promotion and social tabs in Gmail. Not on my primary. It's like a stickied ad that changes everytime I log in. I did setup the same way too. I like Aqua mail for all my accounts. I tried using the Samsung email app, but unfortunately the folders I created in gmail won't open for me in the Samsung email app. Before updating to Pie, didn't have any issues opening them. 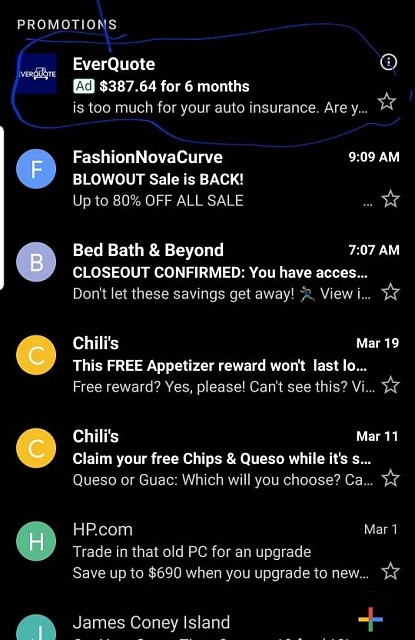 I only checked out the Samsung email app after the Android Pie One UI update. It's better than Gmail but I still prefer BLUE MAIL. Battery comparison of s10e vs s10(regular)?